My last post was about clouds and a silver lining. I have to admit now that the abundance of clouds I described and used only worked for me for about two months. We like to keep in contact with everyone on a regular base, and write maintenance reminder letters to all those clients of which we don't have an email address (yep it does happen we don't have a single email address - people do find us by phone and order materials that "old-fashioned" way), plus for certain tasks in the sales process we use specific letters (such as quotes, order confirmations etc) based on templates. The mentioned Alive Docs turned out to be too cumbersome and could only be used for predetermined letters, plus printing those letters was a hard task: every single one of them had to be emailed to your own address and then you were able to print it - not the most time saving task invented. The linked-in MailChimp (which we already used - for free - for blog alerts for this and the Charing news blog) will charge you if the number of contacts grow above 2000, which is lower than the number of contacts/clients we have. Although the costs of this, combined with the costs for Capsule and Wufoo (the webform program) was still below the original costs of Octane HQ, when I found another CRM program which links with Kashflow and has its own email marketing facility I had no hard time saying goodbye to MailChimp for our main business. 30 days free trial, upload and download data, email marketing, web forms, surveys, mail merge, task management and a bit more. That's what intouchcrm gives you. Intouchcrm has two types of plans: Premium (£ 12.00 per month with 200 email credits and other limits) and Unleashed (£ 18.00 per month with 5000 email credits and hardly any other limits). Since we email all of our contacts (those with an email address of course) at least once every week the 5000 email limit is reached halfway through the month, but even purchasing additional credits (for instance another 5000 for £ 15.00) makes the whole program with its many facilities cheaper than the combined cloud - and way cheaper than Octane HQ while doing all and more! This new program comes with its own help desk, webinairs and practical advice emails, what more can you ask? The savings we make per month, plus the features the program offers was well worth the second switching of programs in a few months time. We settled for Octane HQ, at that moment in time a great 2nd Generation program which suited the bill perfectly (then and there). Before Octane HQ we (you and me) were more used to 1st generation software programs, the ones you had to install on your own PC (or Mac). Application Programming Interface (API) enabled online software is what I call 3rd Generation Software. Each program does what is does best - just like Octane HQ - but the main difference is it "talks" to other programs. Reducing the time and effort for business owners to enter duplicate data from one (online) program into another. End of last year - on Kashflow's forum - I encountered Alex Monaghan, who asked me if I would be interested in a program that would enter all new Ecwid orders straight into my bookkeeping program Kashflow. Now this already happened (partly) when my client paid using Paypal, but all other payment options resulted in having to enter all the data manually (both in Kashflow and in Octane HQ). Alex reported last week that his KFSync was ready to test out and the ease of how seamlessly it worked made me wonder about the effectiveness of Octane HQ. Surely in this time and age there would be a better - automagical - system to use? Looking at Kashflow's Integration Pages it brought me onto Capsule CRM - which when you look at their Addons & Integration Page you'll see various well known programs. That, plus the price of the program itself, sold me and I was off to start the new process of filling Capsule CRM during the 30 days free trial, connecting the programs I needed for our business one by one. Imagine Capsule as Main Program (where I register opportunities and manage our - growing band of - contacts) I've tried to visualise above how the API integration works. Suppose someone comes to our website (a Joomla site, online software with its own add-ons, components and extensions), reads our informative pages and decides to place an order in our secure webshop (Ecwid widgets installed as plug-in), selecting phone payment as payment option. The order is processed in Ecwid, through the KFSync lands within a few seconds in Kashflow and through Kashflow a few seconds later in Capture CRM (*1) - both programs checking if it is a new client or a new order from an existing client. Now suppose another person visits our website and requests one of our additional information filling in one of the Wufoo webforms. And sends the same details to MailChimp who emails the requested information. This person then places an order over the phone, and all I have to do is fill in the address details in Capsule and click the link "export to Kashflow" to create the invoice in the bookkeeping program. Another person used our Support Desk (Zendesk) to ask us a question, through the added Capsule App in Zendesk I can simply export the details to Capsule (and when this person then places an order click the same link to export to Kashflow) and again add them to the appropriate MailChimp list. *1 = do note that Capsule considers every contact coming in from Kashflow an Organization and not - as so many of our clients are - as a person. If you, like me, want to register them as person you'll have to correct this manually in Capsule - which gives me the opportunity to add the odd person to a "Case" - a great feature in this software program to remind yourself of things to print, call etc per contact. In the last two days I received the following emails, both warning me about restriction of my account due to irregular activity. Wow, I want one of those, a bank card that already knows what I'll be spending my money on the next day. You may have noticed that some limitations have been placed on your PayPal account. As a valued PayPal customer, we want to let you know what this means and how to resolve the situation. How do I know this is not a Spoof email? Spoof or ‘phishing’ emails tend to have generic greetings such as "Dear PayPal member". Emails from PayPal will always address you by your first and last name. I do know these phishing methods do get a result once in a while. But to be honest, everyone who falls "victim" do these scams I really can't feel pity for. If you cross the street without paying attention you might get knocked down by a car, if you don't pay attention to all the warnings your bank etc bombards you with you might get robbed. Not your bank's fault, not the government's fault - your fault! If you do fall for these tricks and scams, yes, then you are dumber than dumb. So stop complaining and start paying attention to what exactly you receive in your inbox. When words are not enough to explain a problem or a bug in a software program screenshots normally will help to clarify the problem and speed up the interaction between user and support desk. One of my favourite programs to write documentation, manuals, blog posts and instructions with. Very simple to add screenshots or other images and a multiple way to export the document (or whole manual) to Word, PDF, Blogs, Websites, ScreenSteps Life etc. But using ScreenSteps Desktop for the one-off documents to explain a problem is now a thing of the past. No longer do I need to have a separate "manual" in the program where they add (uneccesarry) to the number of files in my Library. A product name that does exactly what it says on the tin: it clarifies your (one-off) communications. always "at the ready" to quickly take a screenshot - which then automagically opens the program - add a tittle and some - if needed - further details, click share and off it goes as online document to be viewed by the support desk of the company I need to explain the problem to. You can upload it to your (free) account of Clarify-it (which also works with ScreenSteps Desktop) and/or to Dropbox. Automagically the link to the page (hidden for google spiders and bots) on Clarify-it.com is copied to your clipboard and all you have to do is create an email to the support desk you need help from, paste the link and let them sort out the problem. I don't even have to save the document, it's online and when the problem is solved I don't need it any longer so why would I add extra files to my pc? I'm just a silly blogger, I know. But nasty? Early this month I compared Real Time Marketing with the "speed" paper magazines can publish a two-way conversation. I'm known to speak my mind (and known to write double Dutch English too), 'cos I'm just a silly blogger interested in IT, progress, marketing and interaction between various parties. The regular contributor (Sid Bourne) replied in the September issue, but only on our reply - published in July's issue - to his story from May. Not only do I lack proof reading skills, according to Mr Editor I'm nasty too (besides being, as already acknowledged, silly). Funny thing, the Internet. The original post is being found time after time since yesterday (when the September CFJ issue landed on all subscribers doormat) on various phrases all containing: CFJ goes pubic. Oh, those modern times and tools! 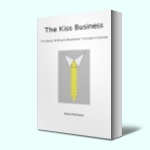 In 2007 I received an email from someone I did not know, but who very kindly had taken time to inform me on a typo he discovered on my site where I explained where the business novel :The Kiss Business was all about. Thanks again for this, Paul F. - hope your business is going well and you enjoyed my book? Now I could of course return the favour and call Mr Editor a nasty and ignorant person, but that would just be silly, wouldn't it? Honourable however, he definitely isn't. Yesterday two things happened, both related to speed of interaction. Being a (full) member of The Directors' Centre Business Club I'm treated every month to interesting, worthwhile articles, tips and videos, collected by Robert Craven's people. At the time of writing this article I have only had time to watch about 35 minutes of the full 50 minutes yesterday, but it left me impressed of what Real-Time journalism (marketing) can establish and am fully aware this "mind-set" is within everyone's grasp and ability. In this day and age of interaction in a blink of an eye, he outlines the importance of a fast response to enquiries and using current trends to get your brand and products talked about. The second thing what happened yesterday: the August issue of Contract Flooring Journal was delivered by our village postman. CFJ is one of the floor trade magazines we're subscribed to. It contains news about floor covering products, preparations, legal and regulation tips/advice etc for the contract flooring trade (as retailers ourselves we are not often involved in contracted work but we like to read everything that is happening in the market). Oh, goodie. CFJ employing "cliff-hanger" tactics. in CFJ's May 2011 issue Sid Bourne wrote something in his article we did not fully agree with (and fortunately, the May edition of CFJ has just been uploaded to their website, so I can now link to the original article, instead of having to scan it from the magazine, print it as PDF, upload it to my own server for you to read). after reading Sid's article we wrote a comment and emailed it to the editor. "We love to get feedback from readers, the more controversial the better.... We work about six weeks ahead, so it will be the July issue." A full six months later for the 4th item in a discussion to be published and read - would anyone still remember what the original article and first comment was about??? Really 21st century breakneck speed here. Come on CFJ, get up to speed. Open up your website for interactive conversations like this. May issue is now pubic *(see edit below), 3 months old news. Extend your website with an "subscribers only" area and have the latest issue there the minute the genuine article lands on our doormat. And allow instant comments and replies on all articles. Having a Facebook profile (not a Page) and a Twitter account is not enough to get new speed. Sid, if you happen to read this, you are kindly invited to publish your reply to our comment right here in the comment box, so we can drag this conversation - in my opinion sure to be a worthwhile exchange of opinions and experiences - into this century of Real-Time journalism. No Alan, pubic IS the word used, "grave typing error" on public. It does exactly what it says on the tin here: known to write double Dutch English ;-). And I plan to leave it in as not to disappoint all those now searching "cfj blog now pubic" (17 and counting). Of course, it would have been much more honourable of Mr Editor, during our email conversation about above "nasty" post early August, to give a gently nudge about the "grave typing error". Apparently, giggling as a schoolboy over the word pubic is more important than keeping up with modern times. logging in to Online Banking is going to become easier! It can't happen fast enough! The idea of creating this E-guide started when I switched from our desktop ecommerce software to the online software Ecwid (Ecommerce Widgets) for our retail secure webshop (still IMHO one of the better decisions we made). Until recently this idea just sat on the back-burner. It wasn't until I started watching and writing about BBC's Britain's Next Best Thing (#bnbt) I realised how needed this simple guide really was. The show on fledgling designers and many mumpreneurs made me truly aware of how many other start-ups, work-from-home-persons, I-have-an-idea-lets-build-a-website youngsters and semi-retired baby boomers could be around. What BNBT also showed us (me in any case) is how little aware many still are on free online programs they can use to start an Ecommerce Venture without having to break the bank and/or without having to know in-depth knowledge of software. You don't have to wait til a high street retailer decides to stock your product before you can start selling, nor do you have to dress down your product or idea to accommodate high street retailers desired purchase price. Just launch the darn product! There are more Ecommerce sites being launched every single day than there are premises being opened for "old-fashion" retail outlets. More and more articles, blog-posts, magazine and even books are written on the rising tide of businesses selling products online. But none, or very few, will hand you the simple steps to launch your own Ecommerce site. It will hand you the online tools to start selling, it does not promise you'll be rich within a day - or a week, it's a tool guide, not a "get-rich-quick" scheme. Who am I to write this guide? Together with my partner I run an independent specialised retail business, he does the installation of the quality wooden flooring I sell. Besides the selling of our products through our showroom I manage our website, blog, ecommerce site and all other web marketing. Single-handedly - without an IT department, without an IT manager, even without an IT background or college grade. However, I only use software programs that comes with an excellent customer support, be it with their documentation, training videos or email support. Some even come with their own users forum or twitter account for instant help. The four online software programs (all award winning software) I will be discussing in this guide are free, and still have superb support available. Why? Because 3 of these programs have fee-paying account levels too. It's the principle of these companies to help you out from the start and they make no difference if you pay for your account or have a free account. Simply said: they hope you will love using their program so much you eventually become a paying customer once you realise how many more benefits a higher account level can give you. That's how I got to know all the ins and outs of the programs in this guide and on most I'm now a fee paying customer. But for starters, the free versions are all you need to get started selling online. The fourth free program is quite different, it has related programs - some free, some "pay-as-you-go" - you might become interested in later. The fifth essential online program you need is one of the so-called "pay-when-you-sell", no fees upfront or fixed monthly contribution. Because of managing the webmarketing "single-handedly", I started to see/learn/experience how programs can be combined to become bigger than their own parts. None of these programs on its own will give you a complete ecommerce site, but by cleverly combining them you'll have absolutely everything you need to start selling your product or products online. Since more and more online software programs are able to "talk" to each other the combining (or linking them together) has become easier than ever. This guide will focus on how to sell your product online as simple, quickly and easy as possible. It is therefore not an in-depth guide on all four individual programs. The title of this guide is called "Selling Online Basics" for a reason, it gives you instantly what you need to get the basics to start selling your product/products online. Later on you can dive into the single programs yourself to see what else they can do, but the "basics" is all you need for the moment. And all of these basics are covered in this guide. So, what's in the guide? An introduction to all the programs you need, the reason(s) why you can start with the free version (if applicable) and how to upgrade to a higher account level of the programs (if applicable for you). A logical sequence of opening accounts for the free version of the online software programs you're going to use for your Ecommerce site (online presence). How to combine/link the programs together into one effective working Ecommerce presence without the need to enter data all over again in separate programs. This guide starts on the premise of not having any the tools yet. Some tools, such as an email address, everyone might already have in place. Then still, it might be very handy, for a one-off product for instance or testing a brand new range, to sign up with the free version of the online tool discussed in this guide. It's the simple combination power between the programs which makes the whole selling online process so simple and effective! From yesterday's BNBT (Britains Next Big Thing) 5th episode, two things stuck in my mind: don't wait for permission and why did some not predict and benefit from the exposure (free marketing!) now their contributions are aired on national TV? In our world of wooden flooring everyone knows of the ongoing legal war between two multinationals in laminated flooring. Who's infringing on who's patent on the click system? This has been going on for years and every time the trade thinks it is finally settled, off they go again for another very expensive legal war in another country. These are multinationals, not work-at-home mums with a great invention many were looking for. Elaine Armstrong, mumpreneur from West-Sussex has looked into patenting her bikeback but the costs to hold a patent can be enormous. When Theo Paphitis remarked on the fact she had not pursued it further, Elaine gave the best answer possible in my opinion: and besides the costs for a patent, I would not have to money to fight any copy-cat. Just ship the darn thing - establish your product as The Original as soon as possible, copy-cats will follow anyway, patent or no patent. At least then you have been able to recoup all the research and development costs. But it seems the bikeback is not yet for sale, anywhere! Waste of buzz created by BBC's program. It only takes 30 minutes to set up a secure online shop (with Ecwid Ecommerce widgets) and start selling the darn thing. Even if it is not yet really polished or if the packaging isn't perfect yet - at least get pre-orders in! Russell Leith's invention of The Ledge - a self-supporting stand, wooden plank/board supported by only one leg and the wall - failed to get into Habitat. Reason: their product technology expert thought it was too much of a risky product that could trigger loads of complaints from clients when their Ledge was knocked over by children or pets (while Russell's' own family and many of his friends don't seem to have a problem with it, having the Ledge in their homes for over 9 years). But by Habitat's decision it seems to be the end of the line for him. While others, still in the running or dropped by one of the three big retailers participating in the program, can at least be found on the web (see here for the full list - as far as known) no Google search can give you any further details on Russ or his Ledge. He himself claimed after the last meeting with Habitat: there is a future for the product. Sure there is and having watched the program there must be plenty of potential buyers out there. But you can't find the darn thing on the wibbly wobbly web at all! Missed opportunity, wasted time going through all the (e)motions of contributing to the program. Any takers out there to pre-order the soon to be launched "Selling Online Basics"? UPDATE 19.05.11: Selling Online Basics" launched!